One day while we were hanging Christmas lights, our dog Cujo gave us a real scare. Unlike his namesake, Cujo does not have a Cujo personality at all, but he is a sweet elderly 13 year old small 8 lb black chihuahua who looks like a mini Pinscher and loves kids and sun bathing outside. Cujo loves to explore, sniffs everywhere during his walks always in search for food like a racoon in knocking down trash cans and "dumpster diving". This particular day, there was no trash can even remotely in the area, but he went exploring through the fence of our neighbor's yard. We believe he had ate a sago palm seed as we immediately rushed to take him to the 24/7 Emergency Vet. The poison in Sago Palm is called Cycasin without any known antidote. Cujo displayed all of the terrible symptoms of vomiting, diarrhea, lethargy, decreased appetite, etc. The emergency vet did X-rays, blood work, and stated that his liver enzymes were elevated. We asked the vet would there be any possibility in any prescriptions to address the elevated liver readings. The vet said the prognosis was dim as there was nothing that could be done. We were distraught as we worried due to his age and him looking so frail he didn't have much longer to live. We asked the vet to provide medication to make him comfortable as they prescribed some anti-nausea, soft food, and antibiotics. Cujo had lost a tremendous amount of weight and refused to eat. He looked like a doggie Skelator and wasted away down to even 5 lbs. We creatively found ways to get him nutrients by replacing his water with non-flavored Pedialyte and hand fed him the vet prescribed food. We then looked for natural supplements to help address the elevated liver lab readings. After much research on Google, we found SAM-e, S-Adenosylmethionine. Our bodies, whether human or dog produce SAM-e naturally in all cells, but has the most impact on the liver. In being processed by the liver, it produces a powerful antioxidant called glutathione. Glutathione is the source of the liver's ability to detoxify. When there is severe liver damage, there are low levels of glutathione. After many days of SAM-e, Pedialyte, and soft foods, Cujo returned to his normal self. What other ailments can be alleviated and where can SAM-e be purchased? We have also found that SAM-e can also be used for osteoathritis, depression, accidental Tylenol and NSAIDs poisoning, and can be purchased as a supplement over the counter or prescribed through the vet as Denamarin which includes SAM-e, S-Adenosylmethionine, and a compound found in milk thistle called Silybin. It is truly amazing to attest that when all hope was lost, we turned to the naturopathic and holistic remedies which saved Cujo's life. There is no official cure for sago palm poisoning. Even if you think there is an accidental ingestion of any part of the sago palm, please have your dog visit the vet or emergency animal hospital immediately. 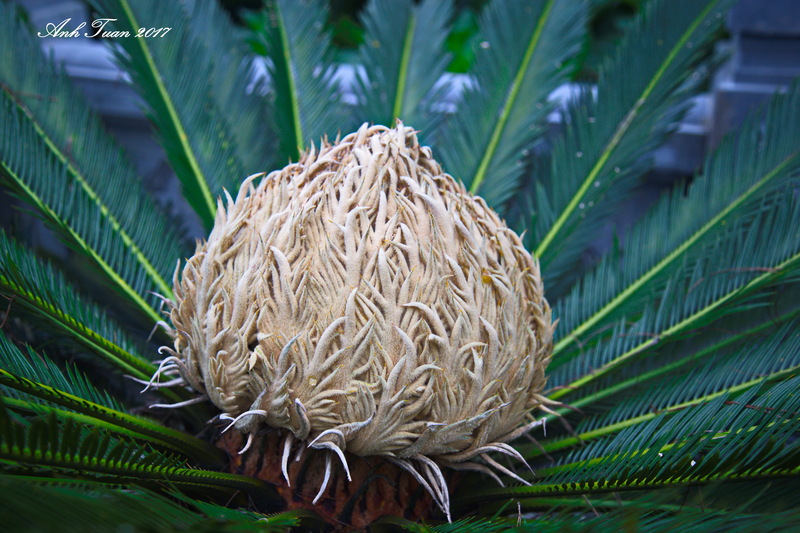 “Flowers of Cycas revoluta" by Le Anh Tuan is licensed under a public domain Creative Commons CC0 1.0.